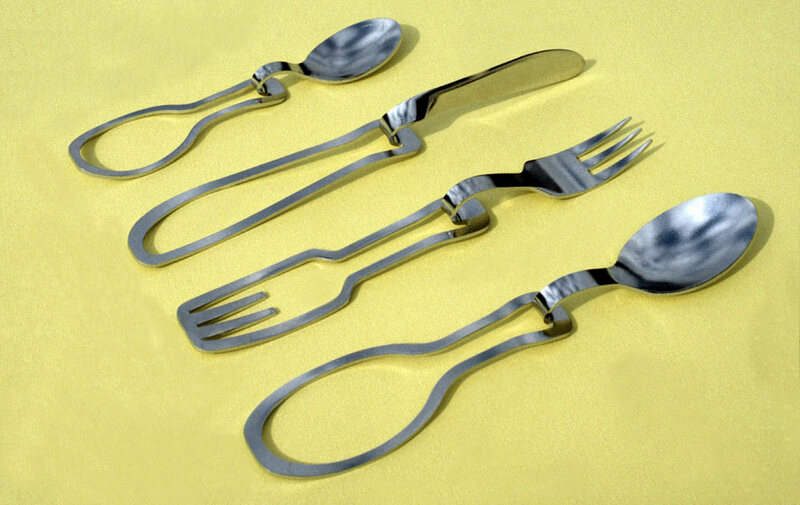 Cutlery that has been laser cut and formed in stainless steel. Produced in a limited batch of fifty sets. The Fold cutlery set is one of a range of laser cut stainless steel products I developed after graduating from my silver-smithing course. The range included salad servers, egg cup and spoon, napkin rings and coasters as well as the fob off key-rings now produced by Trico. All the pieces have a underlying concern with the use of off cuts which I now believe to have been a hang up from working in silver, rather than for any eco reasons. You might find interesting to know that I’ve seen a set of cutlery based on a similar idea, in Germany, back in 1992, at the Deutsches Klingenmuseum in Solingen. A design contest for modern cutlery was organized by the museum and the first prize was attributed to Uta Herbst from Wuppertal for her very nice design. I believe she meant for the holes to be punched instead of laser cut. Drop me a line if you would like to see her design. I’ll try to make decent pictures of the museum catalogue. Thanks for sending the info. Is this the set with very straight handles and each utensil head cut from the top of the handles and reattached? I have seen a design that has a similar story to mine but wasn’t aware who it was or when it was made. Thanks again.